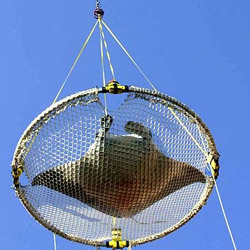 You have been nominated for a 2009 Fins Up Resource Recognition Banner for your site, www.myfishtank.net. Our "Fins Up" program recognizes websites and blogs for their effort in helping fish enthusiasts take better care of their fish. Simply place code for a "Vote for this Site" Fins Up Nominee Banner on your site and tell your visitors and friends to vote by clicking through. Nominated sites who accrue the most votes from fellow fish hobbyists will be personally reviewed by the program host, Drs. Foster and Smith. Remember, the more people you get to vote often throughout 2009 increases your chance of being presented a 2009 Fins Up Resource Recognition Honor! Voting ends December 31, 2009. Top-voted sites will be reviewed by the Nomination Committee who will grant Fins Up Resource Recognition Honors to commendable sites by January 31, 2010. Each top-voted site will receive a banner to proudly display. 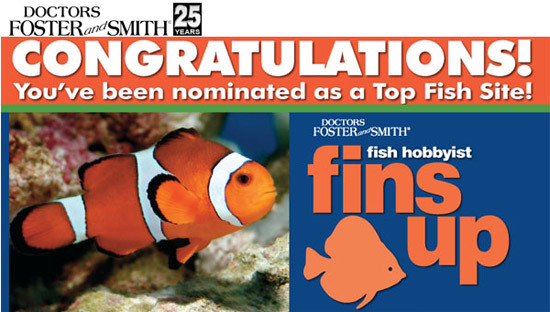 Congratulations on being nominated for your good work in the fish hobby world. Place the "Vote for this Site" banner code in your site today to start the voting process. There is no obligation or fee required to continue. If you are selected to receive the Fins Up Resource Recognition Honor, you will be emailed the award banner by January 31, 2010. So let's see if we can get MFT up on that list! Just click the banner below to vote! Thanks for the support! MyFishtank.net is the most informative site for fish keepers. A forum allows you to connect with other hobbyists and learn everything from diseases to how to care for your fish friends. Also they feature profiles on fish (saltwater and freshwater), plants and other aquatic creatures. Everything I know….I learned from them. I have a fancy goldfish in a tank with a filter and lights. aprox 3 gal. I was wanting to put my siamese fighting fish in with her. I dont like him being in a beta bowl ..it looks to small to me 🙂 Can i put them in together? The tank is NOT cold .but is not heated ..in a warmer location in the house.